The graceful fabric design of our Biltmore Microcoil Mattress was inspired by the wrought iron scrollwork of Biltmore's Grand Staircase. Cradle your body in luxury that exceeds comfort expectations with two self-encased coil systems (one is a microcoil unit) for outstanding conforming support and pressure point relief. 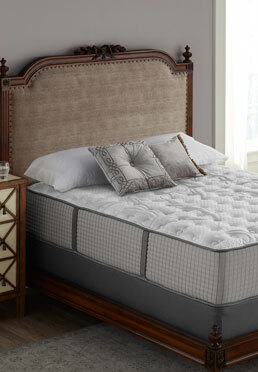 More than 1,300 individually wrapped coils providing a resilient, supportive surface layer of comfort. Our patented gel technology will keep you comfortable throughout the night, gently moving heat away from your body for a temperature-controlled micro-climate. Q5 TWIN® Innerspring Support: Restonic’s exclusive innerspring technology delivers edge to edge sleep surface, maximum adjustability and 5 support zones for correct spinal alignment. This proprietary design provides deep, individualized comfort over the entire innerspring system.